At Great American Smiles in Austin, it our mission to help every patient restore their smile so that it shines bright for years to come. For those who have battled cavities or tooth loss for many years, dental implants are often the best option. If a tooth cannot be saved through a filling or a root canal, it might be best to remove it completely and install a dental implant. While the procedure may seem extensive, our expert staff will help you feel at ease and explain the entire process to you before we begin. 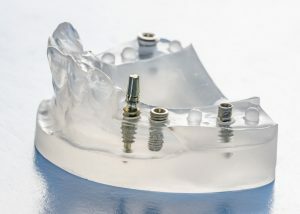 For some patients, dentures or bridges aren’t an option, and they may have tried these devices only to find them uncomfortable or unwieldy. Implant dentistry can offer a more comfortable option that permanently places new teeth in a natural position along the jawline. Metal posts (often titanium) are surgically implanted in the jawbone beneath the gum line, and custom teeth are created to fit on top of those posts. There are two types of dental implants that are commonly installed – endosteal and subperiosteal implants. These implants are installed directly into the jawbone, and are often shaped like small screws. The post is added to the implant, and the replacement tooth is fitted over the top. Endosteal implants are a great option for single teeth that need to be replaced. Subperiosteal implants are installed under the gum line, but not into the jawbone. The metal frame is fitted to the patient’s mouth, and as the gums heal, the frame fixes itself to the jaw. The posts are attached to this frame, and the teeth are fitted to the posts. If you have questions about dental implants, or you want to speak with a dentist about your implant options, please contact us today. We would love to help restore your smile!